If you’ve never experienced greyhound racing before then it’s time you came up to speed. You really need to experience it for yourself, as words only fail to do it justice. Suffice to say, the adrenaline rush whether trackside or at your table, is second to none. If quality counts down on the track, it counts just as much inside and throughout the stadium. Exciting as the racing is, we understand that people should have more than one reason to come to 'The Dogs'. That's why we have spent the last few years perfecting the social side of things and Drumbo Park offers plenty of opportunity to dine and unwind with friends, while enjoying the electric atmosphere of a race night. So whether you are on a large work outing, with a group of friends or simply enjoying a night out, you can really make a night of it. Of course, you don't want to miss anything, and you won't. Wherever you go, wherever you sit to eat or have a drink, you can watch all the live racing action on large plasma screens. 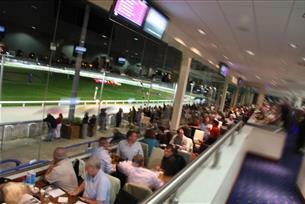 You can even watch live satellite linked races from other great stadiums throughout the country every night. Your comfort is key for an enjoyable night out, so with our well informed tote staff taking bets right at your table and a panoramic view over the track, the only reason to leave your seat is to jump for joy as your dog comes in for the win.